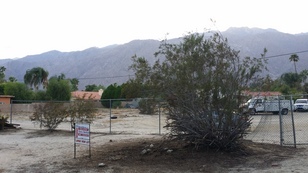 View Lot Center of Palm Springs Movie Colony Ruth Hardy Park District. NO WIRES/LINES to block your views... Existing 2 Bedroom Single Family Home on property, add, remodel,tear down but can save you $$$$ at City Permit Counter...Value In Land + Home, Sellers can offer plans. Property is a Flag Lot with Private Entrance from Arquilla Road. Keep in mind this property has an existing home which means your permit requirements are far less stringent & much less expensive!